It’s tempting to spend it, but how about saving or investing it so you can reap the benefits later? 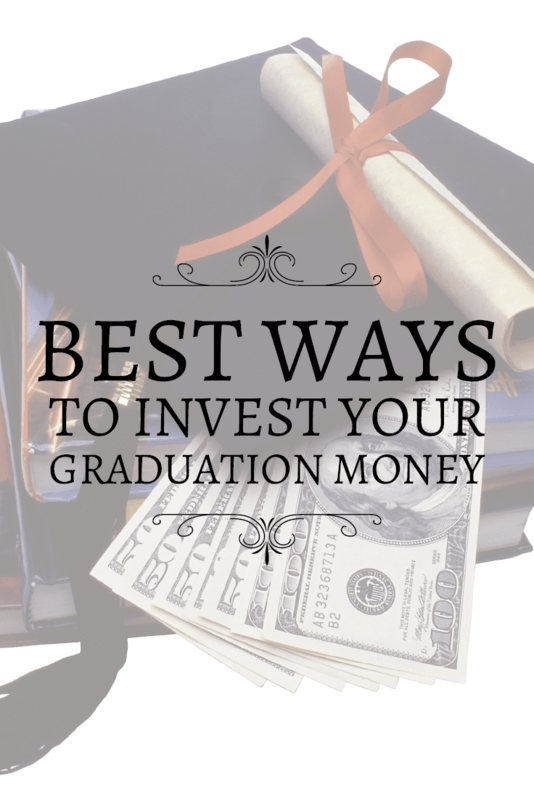 It’s never too early to start saving for a well-funded future and starting with your graduation money is a great path. Here are 3 ideas to get your financial nest egg on the road. Every bank on the planet has options for you to open up a savings account. If you are going to need your money sometime in the near future but would like to keep it someplace safe where you won’t spend it, I suggest you start here. To take it a step further, it might be in your best interest to open up a savings account with an online bank. I mention this for a few reasons. The fact that you are saving with an online bank and not a physical brick-and-mortar one tricks your brain into thinking your money “inaccessible”. This “out of sight, out of mind” psychology will help you keep the money right where it is. With online banks, you still get a debit/ATM card that you can use to make purchases and withdraw money. Withdrawing money however from an outside bank’s ATM always incurs a fee. The extra fee often deters people from making a withdrawal unless it is absolutely necessary. Yet another way to leave your money untouched. 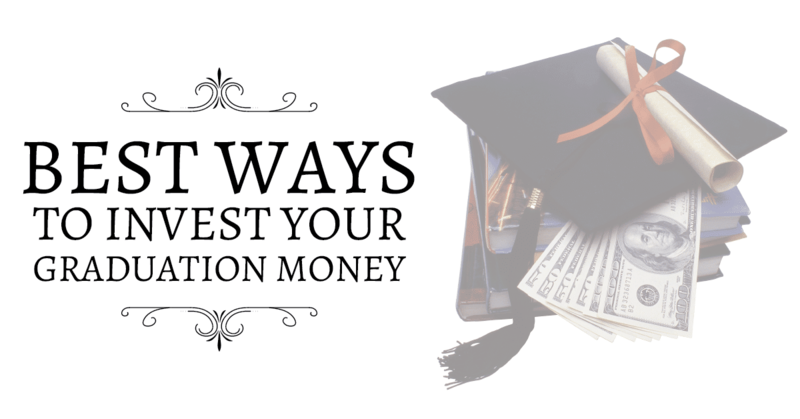 So at the very least, the Monday after graduation, heading to the bank to deposit all that cash into a savings account or opening an online savings with an interest rate will in time put you ahead of the curve financially. A certificate of deposit or CD is another kind of savings product that has a higher interest rate than most basic savings accounts. These interest rates range from about 0.4% to 1.5% and depending on the bank can be compounded monthly or yearly. Most basic savings accounts yield interests as low as 0.01% or you get nothing at all. CDs are offered on a fixed term basis. What this means is that once you open an account, you cannot withdraw your money before the fixed term is over without incurring a penalty. Fixed terms range from as short as 3 months up to 10 years depending on the bank you decide to use. CDs are FDIC insured for up to $250,000 and since there is less risk associated with a CD the likelihood of you losing all your money because of a bad investment is low. If you are just getting started with saving and investing and would like to get your feet wet, opening a CD account is a great way to get started. Here are some options to consider if you are looking for a great return on your money via a CD. If none of the above options appeal to you and you are in the mood to be a little risky with your money - this also usually means GREAT returns - then consider opening an online brokerage account. A brokerage account allows you to invest in different types of stocks, bonds, mutual funds, currencies and every other type of investment you can make all in the same account. You can open brokerage accounts with Fidelity, E-trade and TD ﻿﻿Ameritrade amongst other institutions. In fact, we created the Online Stock Brokerage Comparison tool right here on The College Investor to help you learn about and compare the different companies that offer brokerage accounts. Plus, many people don't realize that there are a lot of free options to invest for free. The nice thing about several of these tools is that you don’t have to start your account off with a lot of money. As mentioned before, with a brokerage account there is the potential for you to make great returns with your money if you are smart and calculated. This also means the risk is high for you to lose your money. Another downside to brokerage accounts are the fees that you are charged to make trades and to maintain your account. Make sure to fully understand the terms and conditions before you commit to a brokerage account. If you don't want to just give money by itself, consider giving an actual share of the kid’s favorite stock (or an ETF) through a fractional share platform. There are a number of websites dedicated to this exact option. Stockpile offers the ability to buy fractional shares in custodial accounts. StockPile charges just $0.99 to buy a share. Both of these platforms make it easy to set up a custodial account for a kid. Plus, you can buy stock shares or ETFs (which give kids a more diversified portfolio). Another cool thing about Stockpile is that you can give stock gift certificates. That way you can actually give the graduate something physical they can redeem and see the process for themselves. For those who are a few years removed from college graduation: when you graduated from college how did you save or invest your money? If you just graduated and have received some graduation money, what are you planning on doing with it? Great advice all around. I signed up for an Ally Savings Account last year and am really happy with them. I agree a CD is better than nothing, but I think the robo-advisers (Wealthfront, Betterment and Acorns, etc) all offer better “hands-off” investment options for those who are new to investing. We are fans of Wealthfront and Betterment, but Acorns charges higher fees than we’d like to see for new investors. I vote for the savings account via online bank. Get a little bit on your money and keep it out of your day to day bank to resist spending it. Many new grads are not sure what they are doing after they graduate. If you are diving in immediately to work, get settled in build your E-fund and then work on paying off student loans, best strategy is to knock them out first and foremost. That’s a great strategy – out of sight, out of mind works great for savings (just not for life’s problems).